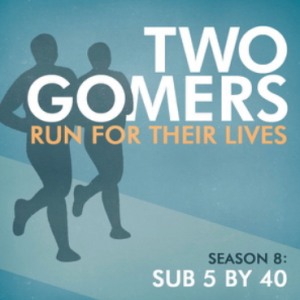 Episode Two is on, and the Gomers are getting into their marathon training. Join them as they talk about headaches vs. migraines, running at night vs. running in the day, chill songs vs. upbeat ones, burgers vs. chicken, and Danny Tanner vs. Joey Gladstone. And so much more: Week in Review, Gomer’s Tips, Songs to Run To, Listener Feedback, and the all new Monday Survey. Happy Running! This week’s Monday Survey: What Fall TV are you looking forward to in the next month or so? Wait, this is a running podcast, isn’t it? Bored to Death on HBO, definitely! That’s as far as something totally new that I’m looking forward to. Also looking forward to, in order of looking forward to-itiveness: Curb Your Enthusiasm, Big Bang Theory (yes, it can definitely be enjoyed by a non-secular crowd, as long as you’re huge dorks), The Office, How I Met your Mother, and eventually Dexter, when it comes back on in October. By the way, I’m very glad you guys decided to do this topic again this year. I listened to Season 1 last month, and I was sorry to have missed out on this survey… and to tell you that YES, I think this TV previews week is a great break from running talk. TV is obviously something you guys love, and it’s cool to know that TV dorks like us who grew up sitting on couches watching Saved by the Bell every afternoon while our jock friends were at cross country practice can still go running! (i don’t know where to reply, you posted on facebook so everyone replied to your thread, but you said to leave comments here). True Confession, I love Full House, but Saved by the Bell is my real feline favorite. It’s awful but I LOVE it! It’s on in the morning when I’m getting ready for work. Also, you guys sound way better in HD, you can totally tell the difference. Note to the other listeners having trouble telling the boys apart … I had trouble last season, but once I realized Anthony was the bassoon player in Florida (gomer1) and Steven was the youth leader in Arizona (gomer2), I was able to tell them apart (since they talk about those things a lot). Can’t wait for Episode 3! Biggest Loser premiere was this week and it was GREAT! It is motivating, but somehow I ended up eating ice cream while I watched. Criminal Minds is next week and I think I’m 1 of 30 fans in the country so not sure how that stays on the air. And Glee. Like others have said, I’m glad to be listening to current podcasts this time around. I picked up your half marathon quest halfway through the season and didn’t catch up until race day. TV – House, How I Met Your Mother, Big Bang Theory, Office, 30 Rock, Biggest Loser and Psych (though their season started a month ago). I totally thought the drumline teaser was from the Miami Vice theme. I was obviously way off, and your Full House tangent was entertaining. Gomers. I’m really looking forward to this season as you take on the marathon. Great podcast! You guys are the “wind beneath my wings”…corny I know, but thats your guys schtick. I’m planning to run the Austin Marathon on Valentines day 2010. 21 weeks. Your podcast so far has put my shoes on. I just ran my second training day today. I dont particularly like running. In fact i think the only time some one should be running is if they are trying to kill something to eat or in the process of being killed themselves. I’m gonna try a marathon without trying a half marathon. I figure shoot for the stars, whats the worst that can happen- your a shooting star if you fall, and those are nice too. Some people wait all night for one. I have a quote to leave you guys with and I may get it wrong but the gist of it is “if you wanna win a race, run the 100 meters…if you wanna have an experiance, run a marathon. -some old olympic dude. My coworkers think im CRAZY. My wife and mother think im gonna hurt myself. And so far the only one that thinks i can do it is my little sister. I was a band dork (not an athlete), I’m currently studying for an architect’s license and i have a 19 month old baby boy. Lots of excuses not to do this, but I, like you, was tired of waking up working, time with family, and go to sleep. Rinse and repeat for 5 years. I will do this. And you guys make it fun. P.S. I cant wait for LOST even though my wife doesnt let me talk during the broadcast. Dont get me wrong, shes the love of my life, but she requires mucho FOCUS. I just finished listening to episode 1 and 2 at the gym today – much to the annoyance of my fellow gym-rats. I think the laughing and almost falling off the elliptical trainer ever three minutes got a bit annoying. Great job, guys! I’m in the UK and really miss my US fall premiers – thank goodness (or al gore) for the internet. I’ve got the premier of House, Grey’s Anatomy, and Lost in my iCal. Definitely excited about The Office. Actually, the season premier just aired this past Thursday, so maybe this is a bad answer since you asked for upcoming shows…but oh well. but my real guilty pleasure is Tool Academy. I can’t believe I just said that outloud. It’s so trashy and fake yet so entertaining. Loved this episode, guys. can’t wait for the next one. Last week, I decided to listen to you guys while on a 6 mile run….didn’t work out so well. I ended up having to change it and listen to music because there was no catchy beat to pound my feet to. But when I did listen, I lol’ed more than a few times, which quickly turned into coughs as I gasped for air. I bet people on the road thought I was crazy. “What is wrong with that girl?” Oh well, I would rather listen to you guys while I am doingother productinve things…like laundry or dusting my room. So in light of Fall TV and Full House…do you all watch Glee!? BECAUSE remember Duck face-the dude who 6 year old Stephanie made fun of at school and uncle Jesse made her call to apologize and then he thought they were dating. Anyway, he was on Glee as a grown up man! CRAZY!!! Stellar work as usual, gentlemen. I don’t watch a whole lot of TV, but I’ve been looking forward to Community. I thought the premier was decent. I’ll watch again. Oh, and I don’t have Dish Network, but I think Friday Night Lights is on that this fall? I’m in love with that show. And Steven…do NOT ever EAT during a podcast again. For the love, man. I have many random things to say. First, love the podcast. Second, I LOVED Full House and I think that Joey is the gomer…Danny just had OCD with all the cleaning and stuff. I am looking forward to Big Bang Theory and Glee. I am a former show choir/choir/band dork and a current music teacher and Glee just cracks me up. I hope to run my second half marathon in a month, but I’ve been having some issues with pain in my legs that I haven’t had before, so we’ll see if that works out. I wish you luck on this adventure! Happy running! I am really going to love Big Bang theory, it gives me the same funny warm-hearted feeling that the podcast does. Also Rachel Zoe Project, and the food network…espeically Barefoot Contessa, she is perfection…OOOH and 30 Rock, i can’t belieive i almost forgot that! Plus Conan,SNL, and Jimmy Fallon. So I am interested in a few new movies this year, but this year is 2012 rather than 2009. I want to see if the show Elementary is as good as its predicessor, Sherlock from BBC. Otherwise, I am up for that one with Kelly from the Office, she has her own show on Fox, should be interesting.